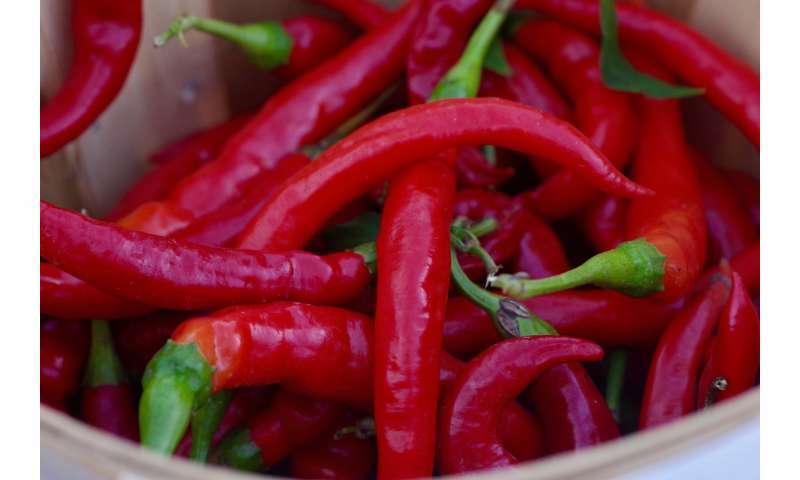 Almost all mammals avoid eating chili peppers and other "hot" foods, because of the pain they induce. But not the tree shrew, according to a study publishing July 12 in the open-access journal PLOS Biology by Yalan Han of the Kunming Institute of Zoology in China, and colleagues. The researchers found that this close relative of primates is unaffected by the active ingredient in chili peppers due to a subtle mutation in the receptor that detects it. They speculate that this is an evolutionary adaptation to enable tree shrews to cope with a peppery plant that makes up part of their diet. Capsaicinoids, including the capsaicin found in chili peppers, are chemicals that deter animals from eating them. They act by triggering the activation of TRPV1, an ion channel found on the surface of pain-sensitive cells in the tongue and elsewhere. TRPV1's normal job is to alert animal to the presence of harmful heat, which is why capsaicinoids induce a sharp burning sensation. While humans may develop a tolerance and even a liking for capsaicinoids, most animals avoid feeding on plants that contain them. The authors observed that Chinese tree shrews (Tupaia belangeri chinensis) actively fed on chili peppers, and, in contrast with mice, did not reduce their food intake as the concentration of capsaicin increased. They found that while the levels of TRPV1 in mice and tree shrews were similar, and both mammals were similarly responsive to other painful stimuli, the TRPV1 ion channel in the tree shrew was much less responsive to capsaicin. The authors then revealed the reason for this; TRPV1 proteins of mice and tree shrews differed by a single amino acid in the binding pocket for capsaicin, a mutation that the researchers found reduced the binding ability, and thus pain-inducing potential, of capsaicin in the tree shrew's form of the protein. While chili peppers themselves do not grow in the tree shrew's environment, a plant that produces abundant capsaicinoids, Piper boehmeriaefolium, does, and is an important food source for the tree shrew. The ability to feed on this plant while most other species avoid it, the authors suggest, was potentially an important driver for the spread of the TRPV1 mutation through the tree shrew population over time. "We propose that this mutation is an evolutionary adaptation that enabled the tree shrew to acquire tolerance for capsaicinoids, thus widening the range of its diet for better survival," Han says. Is it possible that predators of the tree shrew tend to avoid killing and eating tree shrews when they detect that the animal has eaten red hot chili peppers or their equivalent? S_E_U, not a bad guess. Aside from the economics, one of the reasons food and dairy animals are fed limited diets is to control the after flavors of the meat and dairy products. American's preference seems to be for bland flavors.